Shaping stone is a timeless language, each flake a word, each tool a statement of place and time. At some point along the line I convinced myself that learning how to remove channel flakes (fluting) was a good idea. If I lived near a large raw material resource this would be less of an issue as I could go destroy preform after preform while gradually learning the intricate process of creating a channel for hafting with a single strike. The concept of channel flake removal is quite brilliant and usually accompanies other techniques that require a lot of practice to master. In brief, a channel flake is a single flake removed from the base of a biface that serves to create a long, thin area for the haft to fit. This method allows for a relatively robust point to be hafted into a usable dart. Without this special type of haft preparation the projectile would simply be too thick and the weight of the stone point and accompanying (gigantic) haft would render the weapon delivery system physically inept. I'll test that situation soon. 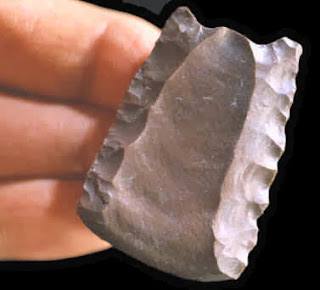 The ability to remove single flakes from the base of a point led to some absolutely fantastic lithic traditions. Clovis, Folsom (my personal fav) and Cumberland points all used this method to varying degrees. But what is the learning curve like? It can't be all that easy...but is it really all that hard? The fact that we find fluted points means it is by no means impossible, and other modern knappers do it all the time. On the other hand, we find channel flake failures all the time too so it can't be that simple. In this test I set out to see what the learning process looks like. Do my attempts at channel flaking mirror the artifacts we find in the archaeological record? What of my failures, do they look like unsuccessful attempts visible archaeologically? This is just the beginning of a long-term project to document the learning process for channel flake removal. Most folks like to show the best products of their endeavors, as if the skill set became magically integrated within one's motor skill vocabulary. Here we enjoy the process and observe the punctuated nature of success. So, here we go. I decided to try a few different point types that used the method of channel flake removal. Specifically, i thought I'd try my hand at fluting Clovis and Folsom preforms. As part of my job is to identify and describe Paleoindian sites in New Mexico, it is to my own benefit to produce and observe the kinds of flakes produced by these early foraging communities. I used obsidian for most bifaces as the ease of flake removal is well suited to this sort of task. I decided to not go overboard with the channel flake removal apparatus. Take a look around the internet and you will find some methods that work well, like giant milled metal lever devices. while a cool modern technological innovation, metal lever devices create assurance and steal adventure, grit and risk right away. I wanted to see if freehand percussion would work sufficiently, given practice. The answer is yes, by the way. There are plenty of great ways to remove channel flakes and freehand percussion is just one method. Creating a channel flake before trimming the point to final form saves time and energy. There seems to be no good reason to spend time making a perfectly symmetrical point, then fold it in half due to a failed flute attempt. Once the channel flaking strategy is a success then spend time on aesthetics. My initial attempts resulted in catastrophe. But, in time my failure has begun to mirror problems evident in the archaeological record. Hey, at least I am failing correctly. There has been some success though. Several channel flakes traveled well and thinned the biface into a usable item. The channel flaking failures, typically when attempting Folsom preforms, carried too far across the surface and removed the opposite tip. This unfortunately reduced the final size of the item. Reduced length means less cutting edge, less material real estate to work with and ultimately translates to less blood loss on impact. These factors are serious attributes when attempting to kill a large angry "something" with a rock. Read around and you will find that creating a convex cross section is key. To little surprise, convexity in the preform turns out to be essential. Just like blade removal from a core (see microblade posts) flaking some convexity into the preform creates a mid line for the channel flake to follow from base to tip. Again, unsurprisingly, platform preparation is essential. Experience suggests uncalculated hope offers little comfort. I am still not satisfied with my platform preparation technique. I have seen some fantastic examples out there and my method needs refinement. A little thing called "mapping" is helpful. By grinding the face to be fluted with a stone one can observe the most prominent area of convexity and build a removal platform accordingly and apply force from the most appropriate direction. Things will continue to get better from here. I'll be excited to keep working on this technique. There are some real masters out there, check it out on youtube if you are interested. Oh, and hey...you don't need a fancy metal flaking leverage jig to get the job done. Take a look at the images below to see how things are working out. This is the start of something fun, we'll see how my technique improves over time.